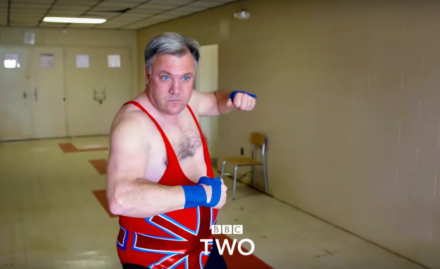 Former Labour MP, shadow chancellor and Strictly contestant Ed Balls will soon be starring in Travels in Trumpland with Ed Balls. The new BBC Two documentary will follow Balls as he travels to America’s Deep South and meets passionate Trump voters. Over three hour-long episodes, viewers will see him get tasered, talk to attendees of a ‘Rednecks with Paychecks’ convention and train with a WWE wrestler. Hence the leotard. Speaking to Leeds Live, Balls said: “Lots of people will assume they’re either deluded and don’t understand, or extreme and dangerous, but we just met really nice, ordinary people. The show will start on Sunday 29th July at 10pm on BBC Two.